Excellent Hyper-V VHD Recovery Solution! VHDX Recovery software is an excellent virtual disk recovery solution that supports higher versions of virtual disk files. VHDX (Hyper-V virtual hard disk)is the new layout developed in Windows server 2012 and other latest versions. Though it's quite similar to VHD format, but it provides you more feature than VHD this software is smartly programmed to support such VHDX files which are corrupt due to various reasons. It helps users restore their maximum possible data from corrupt VHDX files and save them at user-defined location. The tool supports VHDX files that are saved in fixed, dynamic disk types. Note-In client Reviews use VdiskRecovery instead of SysInfoTools. 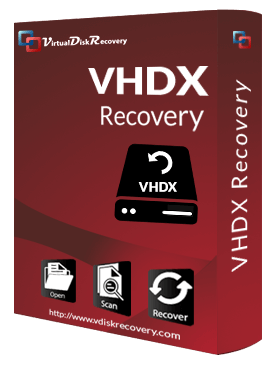 VHDX Recovery software provides you swift and instant recovery solution for recovering maximum possible data from corrupt VHDX files without causing any changes. It has an auto-detect feature that shows you the information of selected VHDX file, such as: file format version, size of HDD, sector per track, number head and cylinder. There are two scanning modes in this software: Standard Mode and Advance Mode. You can select the scanning mode as per the level of corruption in your VHDX files, i.e. standard mode for minor corruption and advance mode for severe corruption. In order to recover maximum possible data from corrupt VHDX files, VHDX Recovery tool provides you three recovery modes: Standard, Advanced and Deep. You can select these recovery modes one by one for handling different level of corruption. VHDX file is saved in Fixed and Dynamic disk types. Software supports both these disk types and restores your maximum possible data from them in their original form. Both the partition tables, i.e. GPT (GUID partition table) and MBR (master boot record) are highly supported by this software. MBR format is selected by default. Software supports all the popular file systems used in various operating systems, such as: FAT (all variants, i.e. FAT 12, FAT 32 & FAT 64) and NTFS of Windows, HFS+ of Mac and EXTX of Linux. You can define custom settings for selected drive as well as volume. The custom settings include starting & ending sectors, and the file system in which you want to treat the volume. If any volume is missing from the list, you can add a new custom volume by clicking Add Custom Volume button. Also, you can define its custom settings before starting the recovery operation. There is a smart RAW Recovery mode in this software, available with Treat file system as option. It supports recovery of image (5 MB), audio (6 MB) and archive (1 GB) formats by default. During RAW recovery, you can add new signatures to the existing file or new one for recovering more data other than image, audio and archive files. 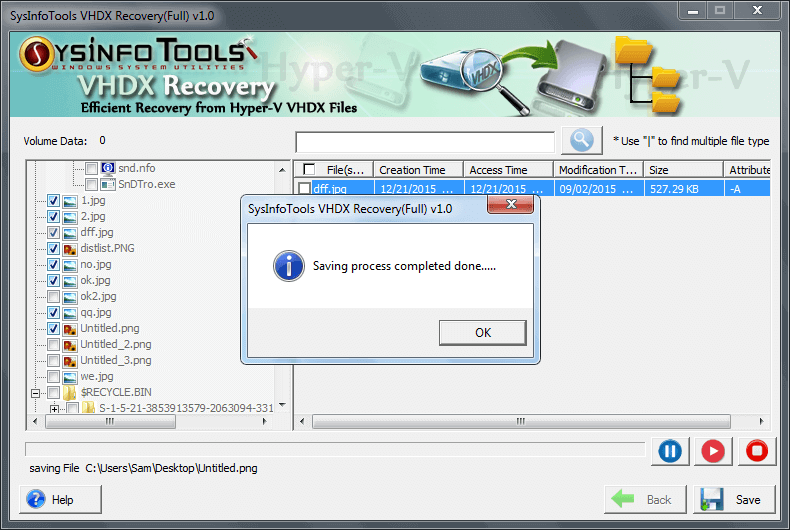 VHDX Recovery software also supports recovery from accidentally formatted drives. You just need to check Is Drive Formatted box to enable this feature. Once the scanning and recovery operations are completed, software will show you a tree-structure preview of recovered files and folders. Also, you can check the file properties before saving them. The auto-search option in this software allows you to search specific files by entering their names or types in the search box. You can search single as well as multiple files at the same time in just a single click. The user-interface of this software is highly interactive, so it doesn't require any prior technical expertise. Any technical or non-technical user can use this software with ease. Being a Windows system utility, it provides smooth compatibility with all major versions of Windows operating systems including the latest Windows 10 (32-bit & 64-bit). SysInfoTools Outlook Duplicate Remover provided many unique features in a cheaper price and that why I've selected this from all others. Selection of comparison criteria, displays file's information in a single pane and data range attracts me more. Rated - 5 star! SysInfoTools NSF merge tool is better than others because in a low price this tool provides me some important features such as independent saving, auto search and multiple merging options. While some other tools was not in my budget and lack somewhere to fulfill my requirements. As I am computer professional so there were many times, when I purchased such tools. But, SysInfoTools is the best, because they provided me excellent NSF merge tool and better support service than others. Now, I would like to become the regular customer of SysInfoTools. What is the difference between VHD and VHDX? Generally, there is no such difference between VHD and VHDX as both are Virtual hard disk formats. VHDX is the new format used by Windows Server 2012 and later versions, whereas VHD is the old format used by Windows Vista and 7. What are the different types of files systems supported by this software? VHDX Recovery software supports all popular file systems, such as: FAT, FAT16, FAT32, FAT64 & NTFS of Windows system, HFS+ of Mac system and EXTX of Linux system. What is the recovery rate of this software? Recovery rate simply depends upon the level of corruption in your VHDX files. There are two modes for intensive scanning: Standard and Advance. Also, users can perform data recovery from corrupt VHDX files in three different modes: Standard for minor corruption, Advanced for moderate corruption and Deep for severe corruption. Such options for file scanning and recovery would be helpful for you to restore maximum possible data. How RAW recovery mode is helpful for me? RAW recovery should be used when all three recovery modes fail to recover your data from corrupt VHDX files. The RAW recovery is available with Treat file system as option. Just select RAW in the options. Click Parse button to start parsing the selected volume. It will take a couple of minutes, please be patience. RAW Recovery by default supports recovery of image files (5 MB), archive files (1 GB) and audio files (6 MB). Also, it allows users to add new signatures on a new file or the existing one. This feature is helpful for recovering other file types as well. Click the Gear button shown next to [Add new signatures in new/existing file] and define the file settings. After that, you can save the new defined entries at any location. Once you have done this, you can upload the file for parsing. Can I add a custom volume in my VHDX file for complete recovery? Yes, you can add a custom volume for complete recovery with Advance Scanning mode. Once the file scanning is done, you can see the available volumes in the list. If you think the volumes size is not correct or you think there is something more remained in the file, you can add a new volume to the list by clicking Add Custom Volume button. Now select this new volume in the list and click Custom Settings for Selected Volume box. Here you need to define starting and ending sectors as well as the file system which you want to treat this volume as.